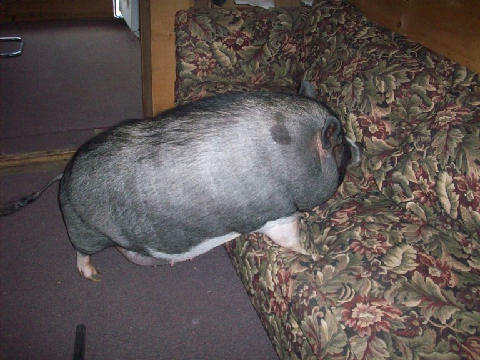 Well we had to leave Iowa to find a place where the pigs can climb on the sofas. The photo above is of "Daisy Mae"–the pig in residence at Denise Vespa's Stable here in Syracuse. Connie is now riding at Denise's stable which also has many wondrous people about–some who climb on horses and some, like me, who sit on the sofa. Personally, if I could ride a sofa I'd be happy. But not as happy as Daisy Mae. Daisy has apparently destroyed six sofas by nesting and digging. But what's a sofa among friends? I know fraternity boys who have destroyed dozens of sofas. In fact I know fraternity boys who are nowhere near as nice as Daisy Mae. BTW, if you're feeling a little bloated after Thanksgiving, just think of Daisy. Clearly if you're the barn pig, everyday is Thanksgiving.